Aberystwyth Lifeboat Station is an RNLI lifeboat station in the coastal resort of Aberystwyth, Ceredigion, West Wales. It was established in 1861, but there has been a lifeboat serving the town since 1843. Since 2007 the station has operated an Atlantic 85-class inshore lifeboat, RNLB Spirit of Friendship (B-822), launched by submersible tractor. The station also has an Arancia IRB as support for the larger Atlantic 85-class inshore lifeboat. The first lifeboat at Aberystwyth was a 27 ft, 6-oared boat funded by public subscription in 1843 and under the control of the harbour master. 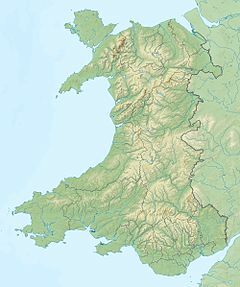 In 1861 the RNLI took over the service, completing a chain of RNLI stations along the coast of Cardigan Bay from Strumble Head to the Llŷn Peninsula. The 10-oared Evelyn Wood was the first RNLI lifeboat. A severe gale on 29 December 1900 saw Coxswain David Williams launch the lifeboat to a fishing smack; in heavy seas three lifeboatmen (Jack Williams, Tom Jones and J.C. Rea) were thrown overboard but were rescued by their fellow crewmen. Despite the loss of most of their oars they managed to beach the lifeboat and hold it until the tide ebbed. In the meantime the fishermen, whose boat was wrecked on the rocks, made it safely to shore. In February 1946 Frederick Angus was at sea for more than 24 hours in severe weather standing by the broken down submarine HMS Universal and helping to rescue her crew. In 1964 Aberystwyth was the first RNLI lifeboat station to change from offshore to solely inshore lifeboats. The Arancia IRB was established in Aberystwyth in 2013 and was dedicated in Holy Trinity Church, it is believed to be the first and only lifeboat to be dedicated within a church. Aberystwyth has been served by a number of lifeboats in its more than 150 years of operation by the RNLI and more than 170 years in total. A number of awards have been made to recognise exemplary service to the RNLI. 1991 Bronze medals to C-class Helmsman Peter Heading and crew member Robert Gorman, skipper of fishing vessel Seren-y-mor for the rescue of yacht Otter's solo crew member. Thanks of the Institution inscribed on Vellum to crew member Michael Harris for his part in the same service. Framed letters of appreciation to David Davies and Martin Porter, lifeboat crew, and Alan Blair, Brian Slack, Bryan Pugh-Jones and Sandro James, members of the Seren-Y-Mor crew. The Ralph Glister Award was awarded to the crew for this service. This station is classed as an RNLI "Observe" lifeboat station; it welcomes visitors via appointment. Groups (schools, clubs, organisations) who wish to visit the station can request a tour and presentation via the stations website. ^ "RNLI – Aberystwyth Lifeboat Station". Retrieved 22 October 2014. ^ a b "Aberystwyth Lifeboat Station History". Retrieved 22 October 2014. ^ "History Points – Aberystwyth Lifeboat Station". Retrieved 22 October 2014. ^ a b "Peoples Collection Wales". Retrieved 22 October 2014. ^ "RNLI lifeboat's Welsh church blessing is UK first". walesonline. Retrieved 22 April 2016. ^ "Blessing in church for rescue craft | The Times". The Times. Retrieved 22 April 2016. ^ "A History of Courage". 22 May 1987. Retrieved 22 October 2014. ^ "Lifeboat Landmarks". 29 May 1987. Retrieved 22 October 2014. ^ "Inshore rescue - 3 miles from the sea". 5 June 1987. Retrieved 22 October 2014. ^ "Aberystwyth Lifeboat Station". RNLI. Retrieved 22 April 2016. ^ Lifeboat, Aberystwyth. "Visit Us". www.aberystwythlifeboat.org.uk. Retrieved 22 April 2016. Wikimedia Commons has media related to Aberystwyth Lifeboat Station. This page was last edited on 4 November 2018, at 22:20 (UTC).